Louise Gagnon, our new Chairman, gave a lengthy and most impressive speech at our recent AGM and it’s been suggested that people might like to hear it again (or read it), so here it is. As we all know, a very important part of a Chairperson’s mandate is to provide a focus, a sense of future direction for the activities of the club. So I set about consulting with as many of you as I could, I must have spoken to at least 30 or 40 members, always asking the same 3 questions: where does the club need to go? What do we need to do less of, do more of. I then put all the answers in a big sieve, added my own views, and selected 5 straightforward objectives. So please sit back and let me spend 10 minutes describing where I think our Club should be going. 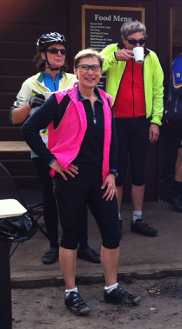 First of all, a bit of a review of where we are: Regarding our bread and butter which is essentially getting out on our bikes to play, Club members are simply unanimous: we have a fantastic rides and events programme… and it is delivered by a team of totally committed and competent Ride Leaders and Event organisers. In turn, these are supported by an equally committed and hard-working Club Committee who actually runs the Club on our behalf – and they do this very well indeed. What’s not to like about that? No wonder Club members are happy! And so I suggest that Objective #1 be to continue improving on what we do very well. … Already there are rumours that 2014 will include night rides, along with the return of breakfast rides and Tuesday evening Summer rides. A lot of good initiatives – so it’s looking good! Let’s talk a little bit about membership & attendance. In the main, our club attracts a steady trickle of very vibrant 45 to 65 year old, enough to keep the club well rejuvenated. We’ve also had, as of late, a recent surge in the participation of current members, which I think is very good news. Where I think we have a real vulnerability however is in our over-reliance on one Group Leader who also does 95% plus of the Ride Leading. Typically, and I’ve seen this a few times in my 8 years with the Club, when this highly experienced Group Leader cannot keep his/her commitment due to personal reasons, the attendance dwindles and, over time, the Group actually starts to waste away, with some of the newer members never to be seen again. So objective #2 is an appeal to Group Leaders to please mentor enough back up Ride Leaders within your group so we don’t disappoint our members. I am old school: the Rides List is a quasi “contract” we have with our members… and we must do our best to deliver high quality rides as per Rides List. So Group Leaders – if you are not doing it already – please step aside from time to time, let the back-up Ride leaders have a go, and enjoy the view from the back! Speaking to many of you, a good 70% have said that you wished to see more younger faces in the Club and also … more women. In fact, many of you said you wanted to see more younger women! … Er, all joking aside, I believe that attracting younger people is not only desirable but it is entirely do-able. But first, we need to recognise that younger people are typically full on with career or parenting obligations. They are time poor and being time poor means that one is limited to a 3 hour pass on an evening or on a Sunday morning. So our third objective should be to do a Spring Launch adding two more types of rides to our repertoire: (1) buzz rides – shorter, harder and faster rides from 9 to 12 on a Sunday morning. Also, (2) bring back the Tuesday evening Summer rides. This is meant to target a younger audience but good on us if we can attract new members of all ages as well. (And my spies tell me that many current members would also be interested in buzz rides and evening rides…). But you may ask: why wait until Spring 2014 to do this? Because I don’t think we are quite ready yet. We’ll need the necessary structure such as extra Ride Leaders to accommodate these new rides. As well, in the 21st Century if you are to attract anyone, the reality is that you need to have a crisp and inviting website. The current one we have works OK but it does not look like a cycling website, unless you dig a little. And being a bit dull in 2013 is likely to put people off. I think the website has served its purpose very well indeed and hats off to the people who have created and maintained it so far. But it needs updating and many people realise this. And so a refreshed website is what I think should be our fourth objective. If you look up CTC Wantage on the net, you’ll get a good view of the presentation and functionality I think we should be aiming for. Roads are now busier, much busier. There are also much fewer quiet roads as many of them have been turned into rabbit runs thanks to Sat Navs. Also cars are much more powerful than they used to be. In the 70’s you could hear the little Austin gearing up to overtake you… and it took a while for it to do so! Now, powerful Audis can overtake you in seconds few with very little warning – 1.5 ton of metal coming near you at very high velocity…. as if it came out of nowhere. So quite clearly, the placid 20th Century group cycling environment of when we had lots of time to react is no longer with us. It’s gone. In 2013, I would submit to you that our margins for error as cyclists have become quite thin. So isn’t time that we also adapt our group cycling to this new reality? Many members have expressed concerns with the growing tensions on our roads. Many of you are conscious that maybe cyclists have an image problem. But surely that must be the “other” cyclists, you know those pelotons that come down from London on weekends, not us! As many of you know an unfortunate incident happened a few months ago in the Surrey hills, when about 12 cyclists were riding two -three abreast, actually blocking the road – a road which had been busy at the rate of about 2 cars a minute. Meanwhile a car driver who had been waiting 10 meters behind the cyclists for over 15 seconds, finally got a little impatient and blew the car horn, you know a long horn of someone really upset. The cyclists took a little while to single out and finally let the car pass. The bad news for us is that this was a group from CTC West Surrey. I know: I was there. But fortunately I can assure you there was not an ounce of arrogance in our behaviour; we were merely a bunch of dreamy-eyed cyclists, just momentarily absent-minded. But what kind of impression did we leave with this driver – what do you think this driver talked about when he got home? He quite likely lumped us in the same category as the sometimes arrogant pelotons coming down from London. Sadly, that’s the kind of stuff that needlessly tarnishes our image. And although most riders and Ride Leaders do things right, such incidents are not rare. I was floored when I heard many experienced riders recently admit that “oh yeah, at times, we are a disgusting bunch of cyclists”. This isn’t new. Even 10 years ago, there had been early warnings when key characters in our club had identified that the way we were cycling was often inappropriate. An article by one of our most senior and most respected members was then published in our Newsletter and it was entitled “The view from the back”. It was not a pretty picture. Even today, it is not unusual to see 10 or 15 riders bunching up at a junction, partially blocking it. (And I am guilty of this!). Single files, 10 to 12 riders long without any gaps – if you are a motorist, that’s like trying to overtake a vehicle 120 feet long! During my enquiry, at least 3 back markers had reported that they had eventually given up calling “car back” because nothing happened – that is no riders would take any notice, let alone take any action to single out. Fortunately, we have many excellent role models as we are surrounded by clubs who have given themselves “hymn sheets” or guidelines if you wish, in order to do just that. 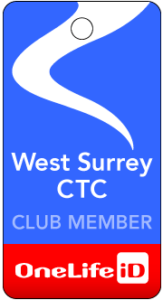 For CTC Reading, CTC Oxfordshire, CTC Portsmouth, Dorking & Kent cycling clubs… for these clubs detailed Group Riding Guidelines adapted to the 21st Century is old stuff. It’s new to us but it’s not new to them. But we have caught up quickly with guidelines of our own… after having, of course, shamelessly “copied” the best bits from what they had! So, the transition to the new guidelines should be easy as 80% is what we do already. Only 20% is new. Still, it’s a learning curve. This is why we must all – riders and ride leaders alike – give ourselves the permission to get it wrong at times. On the other hand, we also need to give ourselves the mechanisms to ensure we get it right. And if there is someone out there who knows about getting it right, surely it must be Sir David Brailsford, who as you know is the coach for the incredibly successful Sky Cycling Team. The success of the Sky Cycling Team is mostly due to one characteristic; it is simply an aggregation of small improvements. In other words, the small stuff adds up! And on how to achieve success, Sir David has this to say: “What you want is to create an environment where there is a quest for continuous improvement: a culture of excellence where everyone is committed to keep questioning how we can do things better”…. “That’s what we try to do from the mechanics upwards. “If a mechanic sticks a tyre on, and someone comes along and says it could be done better, it’s not an insult – it’s because we are always striving for improvement, for those 1% gains in absolutely every single thing we do”. And so it is normal procedure for the Sky Team to meet during training breaks or after a race to discuss how things can be improved and… everyone’s opinion counts. When I read this, I thought “by golly, Sir David has plagiarised the very last article of our guidelines!”. Article # 64; the one under “Post-ride debrief” says: “…. invite riders to provide feedback on what could be improved”. 3 minutes. 3 minutes at the end of a ride, just like the Sky Team; that’s all it takes for you Ride Leaders out there to … bit by bit.. build your group into a well-oiled, safe cycling machine – immaterial of their cycling ability. By now, you know what I am getting at. Our 5th objective should be to inculcate a culture of continuous improvement regarding our group riding. A culture where we strive to continually get better at making our package safer for our riders and more courteous for other road users. And the Post-Ride debrief is one of the two pillars of this. The second pillar is to have Ride Leaders and Back Markers share ideas with each other during a 2 hour Best Practice workshop, say every 6 months. Funded by the Club, they could meet in a pub like this and share the tricks of the trade on how they are making things work. One final thing, just to put the icing on the cake. As one prominent employee of the CTC recently said to me: “one of the things CTC does not do enough is to be seen to promote respect for other road users, even if they don’t respect us…. Cyclists have to initiate the development of mutual respect and tolerance”. Now that’s a statement adapted for the 21st Century! We already know that as groups of cyclists we are typically the most visible members of the cycling community. As a result we don’t need to be reminded why we need to be billboards of exemplary behavior. But we can do more. And if we really want to fast forward the development of that mutual respect there is nothing like the human connection. It’s very simple: a wave and a smile or a thumbs up; simple habits that will see us reinforce any sign of goodwill from other road users. A motorist waits a while to overtake you safely, give her a wave as the car goes by. A motorists waves you past at a junction, wear that smile, connect visually with the driver, and give him a little wave. Slow right down as you go pass walkers on shared paths; say hello. Don’t be shy; be proud to be the best cycling ambassador you can be. Force yourself to win motorists back one at a time… with your exemplary behaviour, with your wave and with your smile. Ladies and gentlemen, keep doing this and I am convinced that one day soon we will re-connect, this time positively, with that motorist that we cheesed off 2 months ago in the Surrey Hills! Thank you.